n alarm that sounds like my Watch Commander or auto pilot alarm, then maybe I'll get up when it goes off!! been taken in our short walk and then get to sleep. Next morning we were up early and off to see the Statue of Liberty! Turned out when we got there, there was about a three hour wait... we decided against waiting around for three hours in the awfully hot weather and reserved tickets for the next day. We moved on to what we had origonally planed to do the next day. oyed every hour of it. Though by the end I was good and ready to move on. ember when it happend, but it was very neat to see. Most of the day was over by then. It was quite a good day. We saw a lot and had a good time. then headed over to the top of the Rock. I went there last time I was in New York, but that last trip was all a bit of a blur, so it was nice to get up there again. nothing to do with it, though it seems to be that I am a bad luck charm around boats! We pulled up to a boat next to two tall ships that belonged to the school. I would have loved to look around, but had a plane to catch, and so, we said good bye, reassured the guys that I would check out the college online and were off to the airport. It had been a crazy few days and I slept most of the plane ride home. I spent one day at home and then was off again. 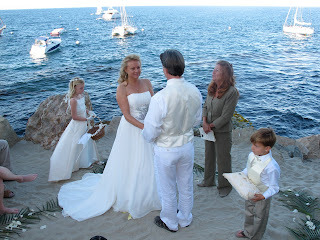 Lisa Gizara, from Gizara Arts got married on the beach at Catalina Island. Lisa has done so much for my trip and for my brother's trip as well. She started way back with the very beginings of Zac's trip and stuck with us right to the end of mine. Now after all we've been through together, she has become a very good family friend. She is an amazing photographer and many of the pictures you see of my trip and of Zac's were taken by her. It was great to be able to be there at her wedding. It was really the most beautiful spot in a bay just a little ways down from Avalon. 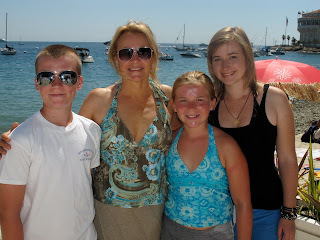 We spent several days at Catalina. My brother Toby and I flew over with Bill from Team Abby. Zac sailed over in Intrepid, and Dad and my sister, Jessie, sailed over with Pieter from Team Abby (and Team Zac). I would have loved to sail, but because of the New York trip, I wasn't back in time to catch a ride with any friends that were sailing over. am going to be helping out again on a job tomorrow, so that should be fun. Anyways, back to Lisa and her wedding. To Lisa, we love you Lisa; thank you so much for everything you have done for me and my family! Well, that about wraps up my blog for today. Don't have too much going on in the next couple of weeks. I'll be speaking here and there at Yacht Clubs and schools, working hard on the book, and starting up school. Since I won't be doing too much, I'll make an effort to blog a bit more. Nice phots. Glady you got to see NYC! tell us what you are doing. Congratulations for what you have done and you're going to do, Abby. 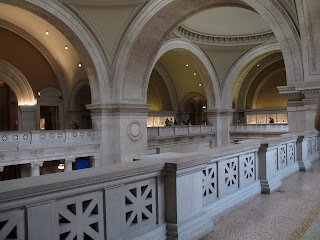 I'm happy you had fun in New York...I really enjoyed while I was reading your blog today! In my opinion you're a good writer, so I hope and I believe that your book will be successful! Great pictures Abby!!! Thanks for sharing with us. It is great to hear that you are enjoying life. I can't wait to read your book!! New York is fun in summer but it winter it is boring there. Nice to hear that you had a great time in NY! The boat thing with the engine breaking down was so funny but hey the most important thing is that you had fun. Thank you for sharing your fun so clearly; it feels like I was there too! A.W. FL. That's the first time I have had to take a coffee break while reading one of your posts....ha ha. Great job Abby....a plethora of information....that's right "plethora"! I loved your line " I was having trouble sitting still" which was evident by your hectic schedule in NYC. 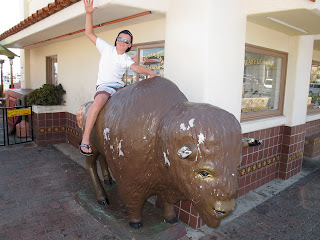 But my favorite photo is the group shot of YOU with Lisa, buffalo rider Toby and Jessie (hi Jessie). And that's fantastic that you are assisting Bill. Having worked on some aerial film shoots myself I know that not so good feeling...pass the gravol please! Here's a tip Abby...if you have the plane window open or the door off make sure your filter etc. doesn't blow off...yes it happens. Landed the plane on a rural highway in western Canada...found it in a luckily plowed farmer's field...unbroken. "Scrubbing a skeleton with a sponge" eh? I just thought of an idea for my own art exhibit...got to go! Thanks for the up-date and the great pictures, and I’m glad to see that you had a good time in New York. 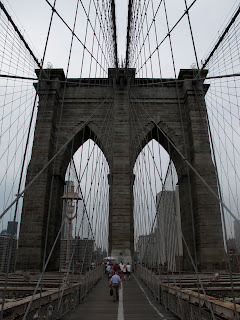 Saw a couple of Museums, The Lady, and did anyone try to sell you the “Brooklyn Bridge” …lol… But there is a lot to see in N.Y. I’m just glad that you saw some of the better things. That was funny about the boat, but you are not a ‘jinx’. It was to bad that you didn’t have more time to take a tour of the ships I know you would have enjoyed that. Good luck to you on your speaking tours and I’m really looking forward to reading your book, glad to see that you are working on that. Sounds to me like your keeping yourself pretty busy, but do write some more when you get a chance. Well it sounds like you've had a hectic time recently, school starts soon doesn't it, thank you for keeping us updated. You're my hero heh. I love the way you do things, so mature for your age. I wish I could go back in time and do things more like you do them. Anyway I live in NY and I am glad you had a pretty good time here. Thanks for sharing Abby... always fun reading about your adventures :) So happy to hear the book is progressing!! Thanks for keeping us updated. I was over at Catalina the same time that you and Zac were but I was at Whites. The surge there was terrible and I wish that we had not stayed all four days there. We could not even go ashore it was so bad. Huge waves were breaking right over Hen rock. They said that the swell was coming all the way from a storm down near New Zealand and I thougt about you and those terrible storms that go on down there. I am sure glad that you are home safe. Enjoy the last bit a summer. Sounds like a nice trip! I've never had an urge to visit NYC; I don't really like being in the middle of a crowd. Still, I'm sure that, as you demonstrated, there are enough things to see and do that anyone can stay interested for a bit. My sailing club is having a trip out to Catalina for the second week-end in October. I haven't been there since I was a middle-school kid, and this'll be the longest sail that I've made. (sounds kinda dumb next to your experience, doesn't it?) We're still looking for skippes and boats since we have more interested members than berths, right now, so if you or your family want to come you'd at least get the entry fee for free! PM me on FB if you're interested. Great to read you news and see all the photo's. You certainly had a great time in the Big Apple. I have been in N.Y. a couple of times, and love the the city. I have never been to Guggenheim, but I can tell you that the first department store IKEA's founder built in Sthlm was inspired by the Guggenheim Museum in N.Y. It's round. Enjoy life and take care. Nice, I want to see NYC one day when I'm not working! Best wishes for the speeches, photography ( aerial or not), writing your book and...Yes, school too! You said, "I need to find an alarm that sounds like my Watch Commander or auto pilot alarm, then maybe I'll get up when it goes off!!" BAAAD idea. You'll de-tune yourself to those sounds just the way you have to your alarm clock, and then you'll then sleep through them next time you're at SEA! Abby, so glad to see you writing and in your own words. We didn't hear enough from you when you were on your voyage! Glad to hear your still alive! Hey there!! Ummm....about that book i spoke of....?? I'm happy that you enjoyed your trips! Although I don't know you and your friends, congratulations to the newlyweds! I have a nephew living in NYC, Manhatten I think! I'm on Facebook using the name James Edric McGrath! Look me up sometime! Nice hearing from you again. Sounds like you've been pretty busy lately. It looks like you better take a lot of spare engines on your sailing trips :). They probably "broke" them on purpose, just to make you feel at home. 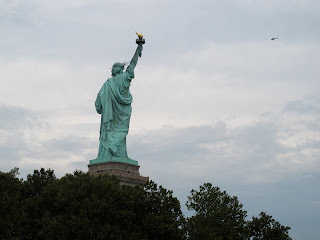 I love the picture of the Statue of Liberty, she means so much to our family. I don't know of very many photo's showing her back side...that is a very impressive photo. In fact I believe that is the only photo I have ever seen, showing her back side. It sounds like you have had a summer of very impressive activities that you will store away in your memory for a very long time to come. I'm glad your family and friends have been supportive of your adventurous activities. A rather casual in-country jaunt, among your famous travels. It's fun, as usual, to read your news. Thanks. nothing to do with it, though it seems to be that I am a bad luck charm around boats!" You are good writer, I am waiting to see your book . At the end you mentioned that you would be speaking at different locations, as a true fan of yours I really would like to attend one of your public appearances to listen to you, shake your hand, and take a picture with you. Congratulations to the bride and groom, very inspiring wedding picture of love and romance, persuasive enough to push me over and make the proposal, wish me luck. I had to use the refresh key on my web browser a few times to be able to read some of the lines that were not completely displayed. Experienced the same thing with the July 5 post also. When I use my iPod as an alarm clock, I use the "old fashioned phone" for the sound - wakes me up every time! Maybe you could find an auto-pilot-alarm sound for your mp3 player. Great pictures! Sounds like a fun trip - almost inspires me to go to NYC. Too bad I didn't know you'd be in the area, I only live about an hour and a half from NYC! But it sounds like it was a whirlwind trip. Glad you are having fun and making the most of the last of the summer. Give my best to your Mom and your family. You have a good eye for photography, I notice you use a good camera the Canon 7D, maybe there is another hidden talent in the future. Thanks for all the updates. Well done. Glad you had a good time. Glad to hear you enjoyed NYC. I lived in Manhattan for a time and it is a whole different kind of a life! Next time you go though, be sure to reserve a few hours to visit Macy's down on 34th Street. My wife and I enjoy browsing there. A trip to NYC isn't complete without a visit to FAO, although you may have been to the one in San Fran already. Finally, if you like Cuban food, be sure to go to Victor's Cafe near Times Square - Our fav restaurant in the world! Nice to hear from you again. Sounds like a fun few days. Nice pictures too. Best wishes to the bride & groom also! The boat Prince Caspian used on his voyage "The Dawn Treader" just sailed into a port in England. The boat will be in the Narnia movie in a few months. Too bad the boat didn't visit the U.S. Anyway, that would be a fun boat to sail on, or at least walk aboard and check out. I loved the narnia movies and that one of the sailing voyage was one of the best. So, if you or Zac or ever over in England, follow up on where the boat is and visit it. You know, Abby, you make landing on Catalina Island by air, sound like nothing. I've also done that, and I remember the runway looking so tiny atop the hills, with a demanding approach followed by an interesting drive down to Avalon. There are bunches of youtube videos on the Web showing landing on Catalina, if anyone doubts it is exciting. But then that short trip surely pales in comparison to your larger adventures, hence you mentioned it only in passing. Hey Abby, Glad you had a good trip to NYC and then to The Island. If you ever need a 42' mooring at Isthmus Cove, be our guest. I had previously left my contact information with Lyall. I've never been to the city, so enjoyed your pictures and descriptions of the surroundings. Hi Abby - Looks like you had a great time in New York! Thanks for your newsy blog and all the photos. It's nice to see you are having some really nice travel experiences. Keep enjoying and keep us up to date. We love hearing from you! Glad to see you're getting at least part of a normal summer vacation. If even you have trouble waking up, I guess there's hope for my 14 year old daughter. She can sleep through alarms that wake the whole rest of the house! Finding an alarm that sounds like your alarms on Wild Eyes may help. When I was in the Navy, I was part of the firefighting team on an aircraft carrier--millions of gallons of fuel in the middle of the ocean in an area about the size of 3 football fields with no where to go if it blows up! We had a little bell they rang over the PA system to call us, and there was a real fire every 1-2 weeks, sometimes at night. Most were very small, but we never knew when we heard the alarm. Returning to land life, I found I would jump every time I heard a bell like that for months--so maybe that strategy will work for you. I think that you should go sailing more if you're really still into it like you say! Jessie Watson is doing all kinds of sailing which speaks well for her passion and will surely help sell her book. You should go do a race or two to show the world you are still passionate about sailing, and maybe sell a few more copies of your book! good luck with everything! Wow ... It's really exciting to read your Blogs and see how much Fun You are having. How's that 'SWEETEST LITTLE SISTER EVER " as You once described Her (in one of your Comments on the Profile Photo with You & Her) ? You two are So much Alike .... Is she going to Follow You In Your Footsteps, and also Sail Around The World ? ... I hope so: I'll Follow her too if she does. ... that you met two guys from ... 'USMMA Sailing Foundation in NY. They were working hard on recruiting me for their sailing team at the school and offered to take me on a tour of the bay' ... (That was really neat of them to do that, Abby). You guys must have had One Fantastic Time, Abby. The photos are fantastic. I keep looking at your Photos and Videos... over and over ... and add comments to some of them; and what I say in the comments, I truly mean from the bottom of my heart, Abby. Even though we have never met in person, or (as yet) have not chatted Online - which I hope someday we can do, I Support & Respect you like a Sister. Each time I read about your Trip or watch the Videos, it brings tears to my eyes, thinking of You & Your Family, and brings back memories of those days of your Voyage. I have exchanged messages with Mike (as he has no doubt told you) ... I found his Profile via Abby Street ... :) ... I also sent your dad a Message passing on My Support. I think I also Sent a Message to Zac. Anyway Abby, You Take Care My Dear FB Friend; and Keep Up The Good Work and High Spirited Attitude. Don't let any of The Negative people that are still whining deter you ... " As If That's Going To Happen "... LOL :) ... " I Don't Think A Team Of Wild Stallions Could Hold You Back !! ". "You CAN And WILL Sail Around The World, Just Like Jessica Watson !!! " ... and I'll be Following You All The Way :). . . " I Truly Believe That ...because... I Truly Believe In You !!!" Dear Capt. Abby, we are still "Followers." Your trips to NYC and Catalina etc. are fascinating to us country folks. Thanks. In this Blog you used terminology, voyage finality. Indicating "the end of mine" - we enjoy thinking just maybe you are taking a "break" while Wild Eyes is being located, rescued and refurbished... oh well, old folks like to dream alot... good hopes and wishes all over you skipper. Glad to hear you're having some fun. I know those coast to coast flights are long. I live in New Jersey and have relatives in California, so I'm often on those flights (6 hours westbound and 5 hours eastbound). That was intense..lol. I actually got drawn into that blog like I do a good book! Glad you got to see the Statue of Liberty. It is crazy about the wait times isnt it. Have you ever been to texas? I live right on the Colorado River, and I have thought about getting a sailboat and just trying to learn. But every time I do.. I see a wakeboard and it wins everytime..lol. You should come down to Texas and wakeboard sometime.. It is huge here. Oh well, I havent said 'Hi' in a while so i figured id drop you a line. I am so glad that you are getting on with your life.I prayed for you while you were sailing and even more earnestly when you were in trouble in the Southern Ocean. The Lord looked after you and brought you safely home. I noticed the cross that you wear,I would love you to let me know what and how much it means to you. To me it reminds me of the great debt that Jesus paid for me and through my faith in Him I have my sins forgiven and have peace with God and a home in Heaven, for that I am eternally grateful.I love your blogs and hope that nyou can keep them coming! Keep doing what you are doing and may God richly bless you! Best wishes to you from Peter in Newcastle Australia. Hey Abby I just read that your in a yacht race on Lake Huron this weekend. Good Luck & Fair Winds to you and your team!!! I hope you win big! Have a great weekend! That's really cool, especially the beach wedding,romantic and special. And one day, I will go there to have a trip!